New New Games is a participatory artwork by Robby Herbst celebrating the democratic and generative New Games spirit and its legacy. The project asks: what is the relationship between game-play and the ideologies surrounding creativity and work? New New Games takes the form of a publication, a series of public conversations, and two distinct play events held in June 2016 co-presented by Southern Exposure and Headlands Center for the Arts. New Games Re:Play at the Headlands will be led by members of the original New Games community. Tournament of Games will be made up of games reflecting on the contemporary moment. New Games first appeared in 1973 as a public event, the first New Games Tournament, held in Marin County’s Gerbode Preserve (now a part of the Marin Headlands). Central figures in its early organization were Stewart Brand (Whole Earth Catalog, The Long Now Foundation, The WELL), George Leonard (Esalen Institute) and Pat Farrington (a Bay Area community organizer). The New Games Foundation was developed to spread the values of New Games: creativity, pleasure, and personally and socially rewarding play. It developed alongside the Bay Area’s post-1960s counterculture. Its first President was Pat Farrington, and early Advisory Board members of the New Games Foundation included Brand and Leonard as well as Nolan Bushnell (founder of Atari Computers), Huey Johnson (founder of the Trust for Public Land), and Marcelle Weed (City of Oakland Parks and Recreation Department). The New Games Book was published and co-authored by Andrew Fluegelman (founding editor of PC World and Macworld magazines and a pioneer of shareware computer software). The influence of New Games today can be felt in everything from Ultimate Frisbee to executive training seminars. Its values of spontaneity, creativity, and playful innovation resonate just as much today as they did in the 1970s when it was a cultural touchstone. Herbst developed this project from an interest in social technique, public performance, and critical art. New New Games is made possible by a grant from the Graue Family Foundation and with the support of Southern Exposure. 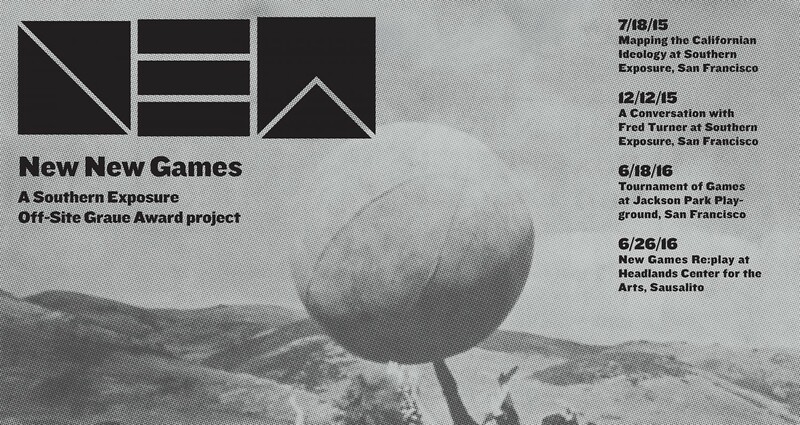 New New Games was developed in part during a residency at the Headlands Center for the Arts.